11/13 UPDATE from City Planner Melissa Garcia: The University Community Plan Update Subcommittee meeting, scheduled for tonight 11/13, has been canceled due to unforeseen circumstances. We apologize for any inconvenience this may have caused. The (Plan Update Subcommittee) meeting will be rescheduled for the month of January 2019 due to the upcoming Holiday Season. 11/13 Update from Chris Nielsen, UCPG Chair: The next meeting of the University Community Planning Group (UCPG) is Tuesday, November 13. 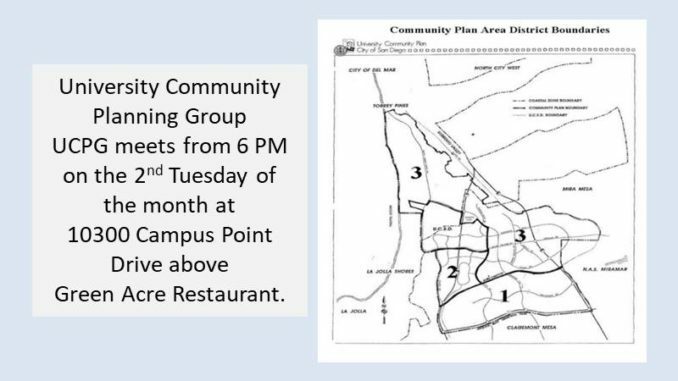 This meeting will have a special starting time, 6:30 PM, so that the first meeting of the Community Plan Update Subcommittee can take place at 6:00 PM. The location remains the same, in the Green Acres Restaurant building, second floor, 10300 Campus Point Drive, San Diego, 92122. All meetings are open to the public and all community members are welcome to attend. Subcommittee meeting 11/13 cancelled: The agenda for the first Subcommittee meeting will be largely organizational. The first order of business will be the selection of a subcommittee Chair, who by rule must be one of the elected UCPG board members also serving on the Subcommittee. It is expected that future meeting dates and times for the subcommittee will be finalized, and a likely set of topics for the first few meetings will be discussed by our City Planner, Dan Monroe. What changes should MTS make in the bus system in order to take advantage of the completion of the Trolley at the end of 2021? MTS is holding a community meeting at Doyle Recreation Center on Tuesday December 4, from 4:00pm to 7:00pm to gather input from community on bus routes and frequency. The format will be Open House, drop in and out. MTS will have staff there to answer your questions and take your suggestions and comments. Veterans Day UC Spotlight: retired Navy Commander William N. Brook, Jr.